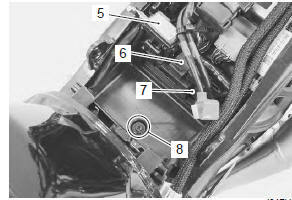 Remove the evap hoses as shown in the evap canister hose routing diagram. Refer to “pair system hose routing diagram” . Install the evap hoses as shown in the evap canister hose routing diagram. Refer to “evap canister hose routing diagram (only for e-33)” . Disconnect the surge hose (1) and purge hose (2). Remove the evap canister (3) from the bracket. Install the evap canister as shown in the evap canister hose routing diagram. Refer to “evap canister hose routing diagram (only for e-33)” . 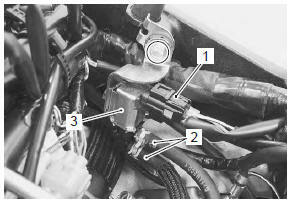 Disconnect the coupler (1) and purge hoses (2). Remove the evap system purge control solenoid valve (3) with the bracket. Remove the evap system purge control solenoid valve from the bracket. 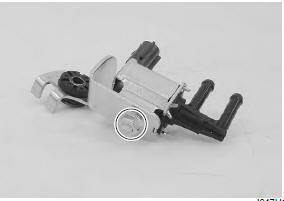 tighten the evap system purge control solenoid valve mounting nut to the specified torque. Tighten the evap system purge control solenoid valve bracket bolt. Remove the battery. Refer to “battery removal and installation” in section 1j . Remove the ecm. Refer to “ecm removal and installation” in section 1c . 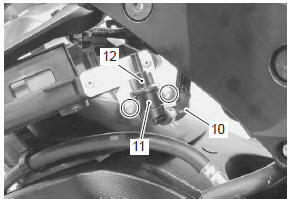 Disconnect the cooling fan relay (1) from the rear fender (front). 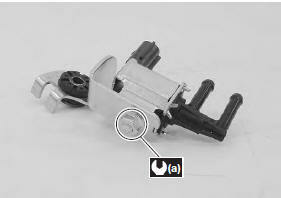 Disconnect the license plate light coupler (2). 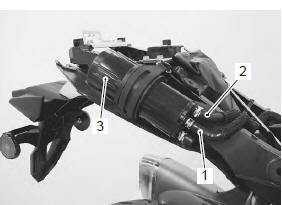 Remove the rear fender (rear) (3). 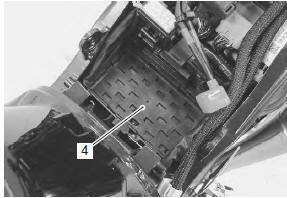 Remove the battery mat (4). 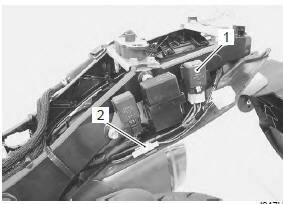 Disconnect the fuse box (5), ap sensor (6) and to sensor (7) from the rear fender (front). 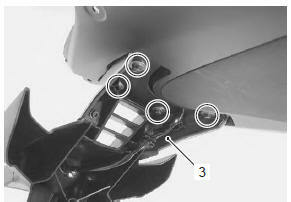 Remove the rear fender (front) mounting bolt (8). 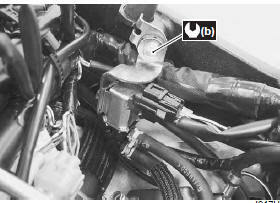 Disconnect the surge hose (9). Move the rear fender (front) backward. Disconnect the surge hose (10). Remove the bracket (11) and fuel shaft-off valve (12). 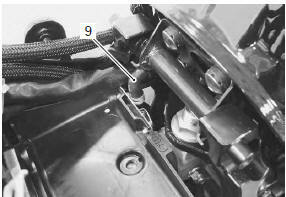 install the fuel shut-off valve as shown in the evap canister hose routing diagram. Refer to “evap canister hose routing diagram (only for e-33)” .